Tarifa is a small town on the Costa de la Luz in the province of Cadiz where the Mediterranean Sea meets the Atlantic Ocean. 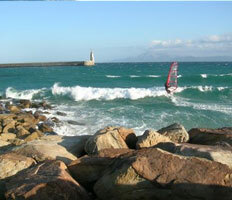 The area is popular with windsurfers and kite surfers due to the strong wind and the resulting size of the waves. Wind and kite-surfing aside, the town is surrounded by 10 kilometres of white sandy beaches next to unspoilt countryside, no big tourist complexes and just great campsites and unpretentious cafés. Combine a laid-back holiday with active sports such as surfing, windsurfing and kite-surfing or whale and dolphin watching. There are regular ferry services in between Tarifa and Morocco (Tangier), with the quickest ferry taking only 35 minutes. 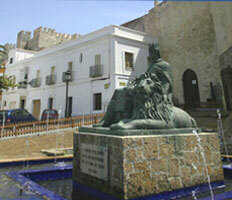 In the centre of Tarifa you will find plenty of tapas bars, restaurants and shops (especially surfer shops). The town also has more than its fair share of historical landmarks, such as the Guzman Castle (a well-preserved castle near the port built in the year 960), the remains of the 13th-century medieval walls and the Church of St Matthew. 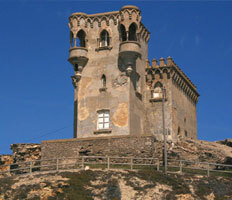 Not far from Tarifa you can also visit the ruins of the Roman city of "Baelo Claudia". Won over by the idea of Tarifa? 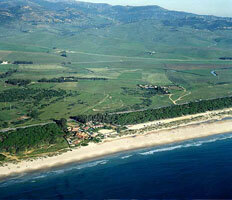 Use the form in the top of the page to find out our prices on cheap airport transfers to Tarifa. Travelling in Andalucia simply couldn't be easier.